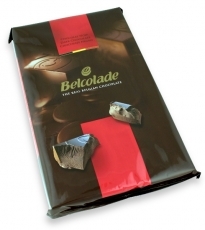 Belcolade Couverture Chocolate, Dark 5kg BLOCK Couverture chocolate has a higher percentage of cocoa butter, which lowers the melting point. This makes it particular good for coating confectionery, cakes, decorating and moulding. A good chocolate is shiny brown, breaks cleanly, and is free of lumps and air pockets. The aroma should be of pure chocolate, not cocoa powder, and it should melt on the tongue like butter. The more cocoa butter it contains, the softer and creamier it should be. Plain Chocolate, is composed of cocoa mass, cocoa butter, sugar, lecithin. Belcolade add the right quantities of these fine substances and blends them, with the intention of flattering the most delicate palate. Belcolade is all of this and more. The home of quality chocolate is Belgium. Not a Fair Trade product. Also available in 10kg drops.